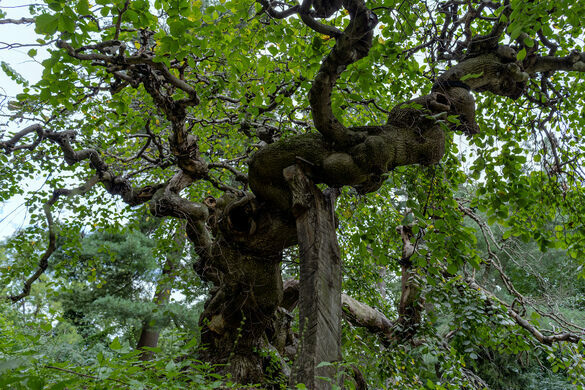 The strangest tree in Brooklyn may be the gnarled branches of the Camperdown Elm near the Prospect Park boathouse. Its branches grow parallel to the ground instead of up, requiring extra support, so gazing up from beneath it is like standing beneath a giant bonsai. Back in the 1960s, this oddly beautiful tree was almost torn down and only got its salvation through a famed poet. The tree is one of the few in the world grown from the Earl of Camperdown’s Scottish estate, which all share the uniquely horizontal growing tendencies. It was planted in Prospect Park in 1872, just a few years after the park opened in 1867, one of the many flora and fauna gifts bestowed on the elegant green space. Moore, then in her late seventies, died in 1972. But thanks to her the tree lived on, a thriving memorial to this day for her dedication to the park and this lonesome elm.